Since the launch of Vent Fou, her first album in June of 1999, Jorane has traveled the earth and captivated hearts across the globe. In 2000, the release of her second album 16mm confirmed her originality in the world of music. The young singer/cellist successfully rose above language barriers and borders. Her style is unique, her message, universal, and her destiny, international! Europe and Asia welcomed her with open arms and claimed her participation on many projects: film soundtrack compositions, compositions for the world of dance, and musical collaborations with numerous artists and symphony orchestras. In fall 2002, Jorane celebrated three successful years of her music career with the launch of her live album, recorded at the Spectrum as part of the Montreal International Jazz Festival. Jorane then crossed Canada and took to the stage in over twenty of its cities. In Europe, you could have caught her in over seventy cities to date (France, Germany, The United Kingdom, Spain, Norway, Belgium, Switzerland, and Austria). Jorane has earned 13 nominations with ADISQ including “Best Composer of the Year”, “ Quebec artist that has extended the farthest outside of Quebec”, and “ Female Artist of the Year”, along with two nominations at the Junos. 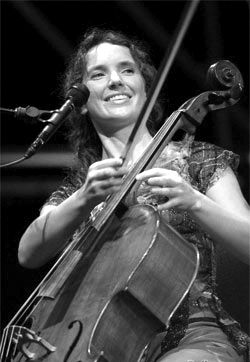 She won the Felix award with Evapore for “Contemporary Folk Album of the Year”, at the ADISQ gala in 2004, and a Gemeaux in the category of “Best Original Music in a Documentary” in 2006 for the music of Lovesick. Jorane has also won a Jutra for the soundtrack to Un dimanche à Kigali last February. She has performed with full orchestra on numerous occasions and with many orchestrations and arrangement co-wriitten by MBTS Artistic Director, Christopher Donison. In 2008 Jorane performer a complete programme for full orchestra at the 400th anniversary of Quebec City with the Orchestre symphonique de Québec. In 2009 She performed with Orchestre Métropolitain with Donison conducting at Fracofollies in Montréal. Here at MBTS she will premiere a new work with resident MBTS musicians.